American visible astronomy satellite. 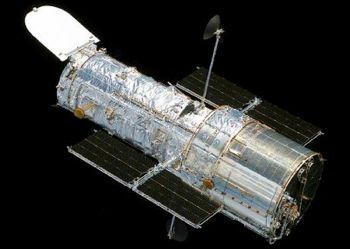 The Hubble Space Telescope was designed to provide a space telescope with an order of magnitude better resolution than ground-based instruments. Astronomy satellite built by Lockheed for NASA, ESA, Europe. Launched 1990. AKA: Hubble Space Telescope. Status: Operational 1990. First Launch: 1990-04-24. Last Launch: 1990-04-24. Number: 1 . Gross mass: 10,863 kg (23,948 lb). Height: 13.30 m (43.60 ft). 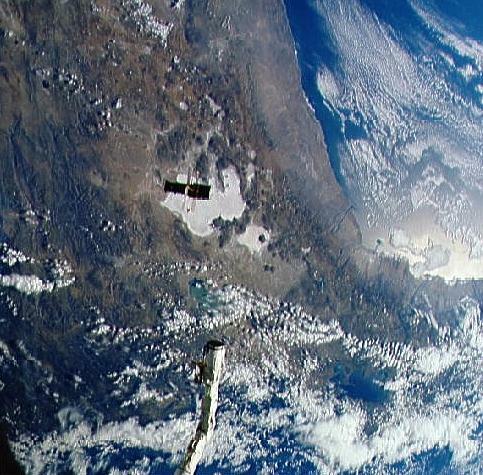 The initially flawed satellite was repaired, maintained, and upgraded in a series of space shuttle missions extending over a decade. provide a long-term space-based research facility for optical astronomy. During initial on-orbit checkout of the Hubble's systems, a flaw in the telescope's main reflective mirror was found that prevented perfect focus of the incoming light. This flaw was caused by the incorrect adjustment of a testing device used in building the mirror. 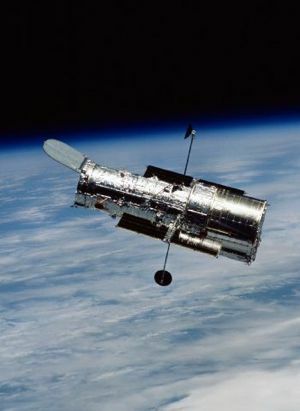 Fortunately, however, Hubble was designed for regular on-orbit maintenance by Shuttle missions. 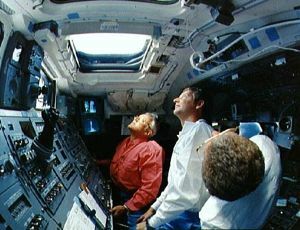 The first servicing mission, STS-61 in December 1993, corrected the problem by installing a corrective optics package and upgraded instruments (as well as replacing other satellite components). Further servicing missions were undertaken in 1997, 1999, and 2002. Hubble's successor, the Webb Next Generation Telescope, was authorized in 2002. 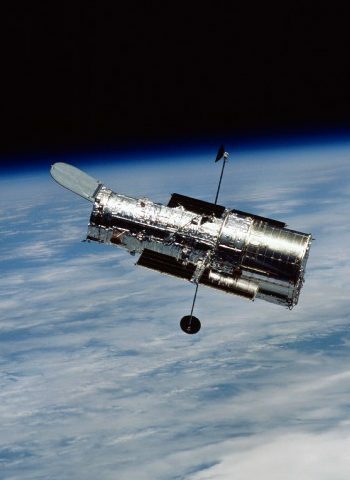 However so valuable was Hubble, that NASA in 2007 decided to proceed to break its rule after the Columbia disaster of not flying solo shuttle missions and planned a final Hubble servicing mission in 2009. 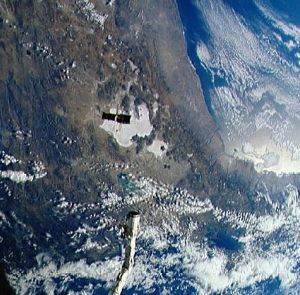 The program included significant participation by ESA, which provided one of the science instruments, the solar arrays, and some operational support to the program. Responsibility for conducting and coordinating the science operations of the Hubble Space Telescope rested with the Space Telescope Science Institute (STScI) at Johns Hopkins University, who operated it for NASA as a general observer facility available to astronomers from all countries. 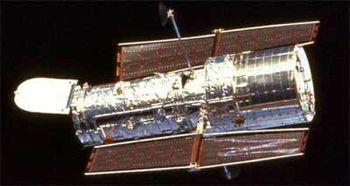 Hubble had a 3-axis stabilized, zero momentum biased control system using reaction wheels with a pointing accuracy of 0.007 arc-sec. Two double-roll-out solar arrays (2.3 m x 12 m) generated 5000 W and fed six 60 Ahr batteries. A hydrazine propulsion system allowed coarse attitude control and orbital correction. The S-band communications system used deployed articulated high gain antennas and provided uplink at 1 kbps and downlink (via TDRSS) at 256-512 kbps. The telescope was an f/24 Ritchey-Chretien Cassegrainian system with a 2.4 m diameter primary mirror and a 0.3 m Zerodur secondary. The effective focal length was 57.6 m. The Corrective Optics Space Telescope Axial Replacement (COSTAR) package was a corrective optics package designed to optically correct the effects of the primary mirror's aberration on the Faint Object Camera (FOC), Faint Object Spectrograph (FOS), and the Goddard High Resolution Spectrograph (GHRS). COSTAR displaced the High Speed Photometer during the first servicing mission to HST. Instruments included the Wide Field Planetary Camera (JPL), which consisted of four cameras that were used for general astronomical observations from far-UV to near-IR. The Faint Object Camera (ESA) used cumulative exposures to study faint objects. The Faint Object Spectrograph (FOS) was used to analyze the properties of celestial objects such as chemical composition and abundances, temperature, radial velocity, rotational velocity, and magnetic fields. The FOS was sensitive from 1150 Angstroms (UV) through 8000 Angstroms (near-IR). The Goddard High Resolution Spectrometer (GHRS) separated incoming light into its spectral components so that the composition, temperature, motion, and other chemical and physical properties of objects could be analyzed. The GHRS was sensitive between 1050 and 3200 Angstroms. STS-103 Hubble Space Telescope (HST) servicing mission SM-3A. STS-109 Hubble Servicing Mission 3B. 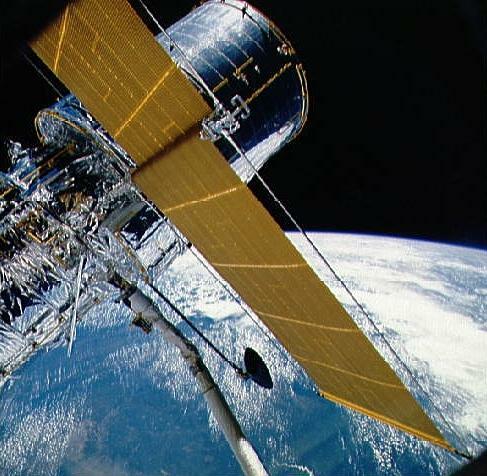 STS-125 Fourth and final servicing mission to the Hubble Space Telescope. Only shuttle mission authorized prior to shuttle retirement not to go to the ISS - therefore with no means of space rescue should the heat shield be damaged during ascent to orbit. STS-128A Hubble Space Telescope Servicing Flight 5. Flight delayed, then cancelled after the Columbia disaster. No crew had been named at the time of the loss of Columbia. Resurrected later after Congressional pressure. STS-31 Deployed the Hubble Space Telescope. STS-51 First shuttle night landing in Florida. Deployed and retrieved Orfeus-SPAS. During the EVA conducted tests in support of the Hubble Space Telescope first servicing mission and future EVAs, including Space Station assembly and maintenance. STS-61 Hubble repair mission. Conducted the most EVAs on a Space Shuttle flight to that date. STS-61-J Planned shuttle mission for deployment of Hubble space telescope. Cancelled after Challenger disaster. STS-82 Hubble repair mission; five spacewalks. Family: Astronomy, Medium earth orbit, Visible astronomy satellite. Country: USA. Launch Vehicles: Space Shuttle. Launch Sites: Cape Canaveral, Cape Canaveral LC39B. Agency: NASA, NASA Huntsville, Lockheed. Bibliography: 2, 279, 3767, 3768, 3769, 3770, 3771, 3772, 3773, 3774, 3775, 3776, 3777, 3778, 3779, 3780, 3781, 3782, 3783, 3784, 3785, 3786, 3787, 3788, 3789, 3790, 3791, 3792, 3793, 3794, 3795, 3796, 3797, 3798, 3799, 3800, 3801, 3802, 3803, 3804, 3805, 3806, 6, 66, 4984, 11189. 2002 March 6 - . 08:28 GMT - . EVA STS-109-3 - . Crew: Grunsfeld, Linnehan. EVA Duration: 0.29 days. Nation: USA. Related Persons: Grunsfeld, Linnehan. Program: ISS. Flight: STS-109. Spacecraft: Columbia, HST. Depress was at 0825 UTC and repress at 1516 UTC. The HST was powered entirely down and astronauts changed out the power control unit..
HST redeployed - . Nation: USA. Spacecraft: Columbia, HST. HST was deployed from Columbia at 1004 UTC on into a 578 x 584 km x 28.5 deg orbit..
2002 September 5 - . Webb / Next Generation Space Telescope contract award - . Nation: USA. Class: Astronomy. Type: Astronomy satellite. Spacecraft: HST, WST. NASA awarded TRW a $824 million contract to build the Next Generation Space Telescope, redesignated the James Webb Space Telescope. TRW beat out Lockheed Martin, builder of the Hubble Space Telescope which the Webb was to replace. Launch of the 6-metre aperture telescope was not expected until 2010 at the earliest. 2004 April 15 - . STS-122 (cancelled) - . Nation: USA. Agency: NASA. Program: ISS. 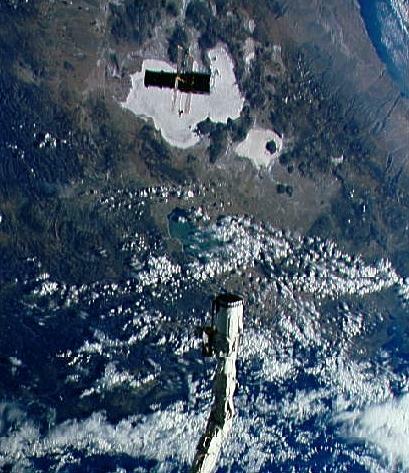 Flight: STS-122 ISS EO-16. Spacecraft: Columbia, HST. Flight delayed after the Columbia disaster. 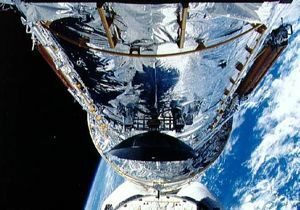 Columbia would have flown Hubble Space Telescope Servicing Mission 4. No crew had been named at the time of the loss of Columbia..